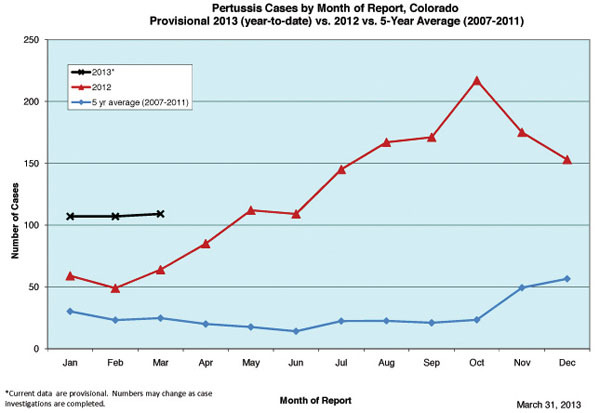 Throughout 2012, incidences of pertussis, a disease also known as whooping cough, rose across the nation. As early as April last year, some states began declaring epidemics with thousands of cases reported. Colorado declared epidemic status Aug. 20. At the end of the year, there were 1,505 cases reported, the most recorded for the past six decades. The majority of the cases reported in Colorado, according to data from the Colorado Department of Public Health and Environment, occurred in Jefferson County (277), Denver (211) and Adams County (206). The same chart showed only one reported case for Summit County for all of 2012. A smaller population may be one reason that the county has been spared so far, as most of Colorado’s cases are concentrated in areas of high population, such as the Denver metro area. However, while Summit County seems to have avoided an outbreak, that is no reason for people to drop their guard. “Statewide, we are considered to still be having epidemic levels of the illness and continue to encourage everyone to be up-to-date with their pertussis vaccinations,” Wineland stated. Whooping cough, or pertussis, is a contagious disease, usually transmitted by air when an infected person coughs or sneezes. One sick person can potentially infect up to 12 or 15 others. The disease affects all ages, from infants to adults. One of the symptoms is a persistent cough that lasts for weeks. The disease has been known as the ‘100 day cough.’ As it gets more severe, the cough forces all the air out of the sick person’s lungs, causing them to draw in a big breath, often creating a ‘whooping’ sound, for which the disease is named. The cough is not the only symptom, nor is it necessarily always present. According to Wineland, for the first seven to 10 days after exposure, a person will show the signs of a mild cold – runny nose and a low-grade fever. Within two weeks the symptoms become more severe, including coughing fits that are usually worse at night. Infants are highly susceptible to the disease, which can turn deadly if not properly treated. They do not always exhibit the cough. The most common symptom for babies is apnea, which is when they struggle to breathe, or stop altogether. More than 50 percent of infants under the age of 1 with pertussis end up hospitalized. Prevention methods include a safe, proper cough, conducted into the elbow, not the hands which are then used to touch common surfaces such as handrails or door knobs. Regularly washing hands also helps. Vaccination is a good way to prevent coming down with pertussis. Anyone who works with children on a daily basis is recommended to get the vaccine. Adults, teens and children over the age of 5 can get a pertussis vaccination, called a TDaP shot, which gives a combined vaccination for tetanus, diphtheria and pertussis. The vaccinations can be found at the public health office and various pharmacies around the county including Safeway, City Market and Walgreens. Anyone unsure of where to get the vaccine or whether they need to receive it should contact their health care provider.